At the core of the book is the ‘rich and complex branch of mathematics’ known as symmetry. But, as Jackson suggests, the equations can be stripped away by approaching symmetry as a visual subject that is immediately accessible to designers. The importance of symmetry and repeat patterns within design is evident all around us. We are surrounded by two and three-dimensional motifs and repeating patterns on ceilings, furnishings and other aspects of interior and exterior design. 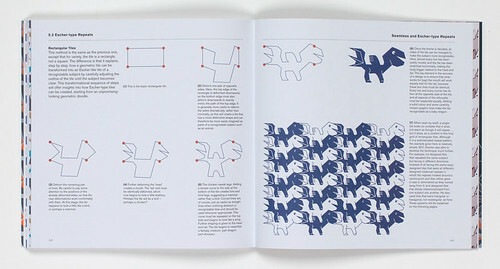 Encouraged to draw upon his ‘strong but mostly intuitive understanding of how to use the laws of symmetry to create repeat patterns of folds’, Jackson applies his visual and tactile knowledge of symmetry within origami [see ‘Surface to space’ in Eye 67] to explain the principles of repeat pattern making. Jackson demonstrates the four basic symmetry operations that are easy to see on the page: rotation, translation, reflection and glide reflection. Using lowercase letterforms as basic elements, he then presents step-by-step guides to undertaking each symmetry operation, as well as showing how to combine operations together to create increasingly elaborate designs. In addition to explaining how symmetry creates motifs and patterns, Jackson also shows how symmetry operations can be applied with endless creativity to make one type of rotational pattern, seven distinct types of linear pattern and seventeen distinct types of planar pattern. He also explains how to tile polygons, create complex repeats and produce wallpaper-type patterns that appear to repeat seamlessly. Spread showing ‘Glide Reflection Symmetry’. What comes through so clearly in Jackson’s work is the potential for creativity to evolve from initially very simple forms. The lower case letters he uses quickly reveal the near infinite potential for creative and structural play. 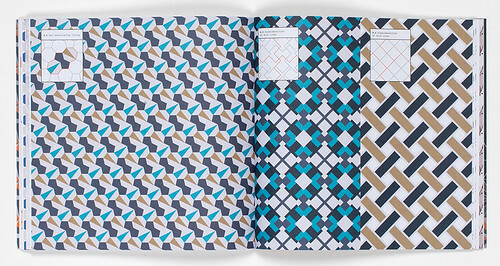 He also makes important distinctions between potentially similar looking parts within the pattern-making process – such as elements, motifs, cells and tiles – to ensure the reader is equipped with the terminology and understanding to develop their own work. While acknowledging that computer-aided design is exceptionally apt for exploring and manipulating patterns, Jackson is keen to promote the merits of lower-tech methods. Photocopiers, linocut prints, photographs, discarded ephemera, rubbings, found objects, and more, can all provide graphic effects and textures that are difficult to generate digitally, so designers are encouraged to think of the computer ‘as the last resort, rather than the first’. Like two other exponents of experimental play, Armin Lindauer and Betina Müller in Experimental Design: Visual Methods and Systematic Play [see ‘Systematic play’ in Eye 95], Jackson advocates reading his book in sequence for a deeper and better understanding of the subject. A glossary provides a reminder of key terms and phrases used, while short segments within each of the five chapters are linked using coloured examples of repeat patterns. 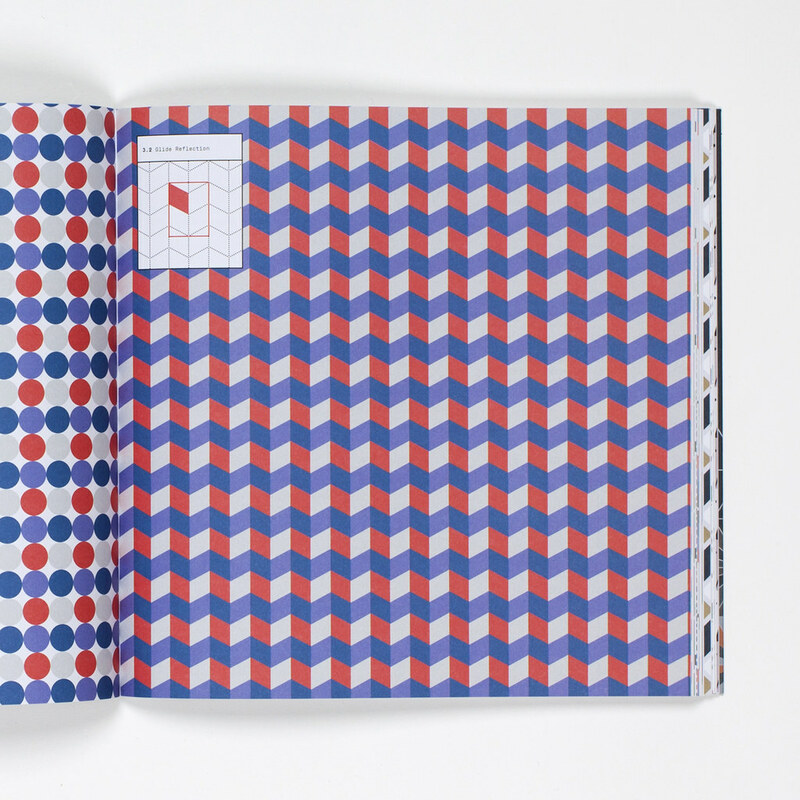 Building from ‘The Four Basic Symmetry Operations’, through ‘Linear Symmetry’, ‘Planar Symmetry’, and ‘Tiling’, the final chapter focuses on constructing ‘Seamless and Escher-type Repeats’, while consistently advocating the all-important idea of learning the rules, with care, in order to then test their boundaries or even break them, with the full understanding of which rules are being broken and why. This combination of depth of knowledge mixed with the vitality of purposeful and creative rule-breaking feels central to Jackson’s design ethos. Jackson explicitly states that this is not a book of pattern sources. 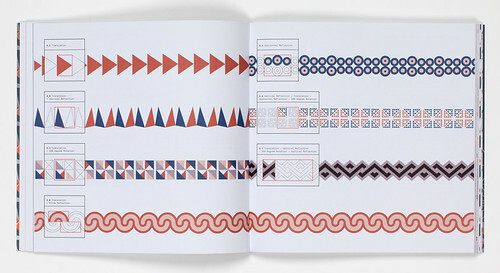 How To Make Repeat Patterns is an engaging visual guide to the processes of symmetry that create repeat patterns. Symmetry is not just about mirror reflections; it is about playful creativity, understanding the relationship between constituent parts, and having the knowledge and skill to adapt, re-create, experiment and break rules with confidence. 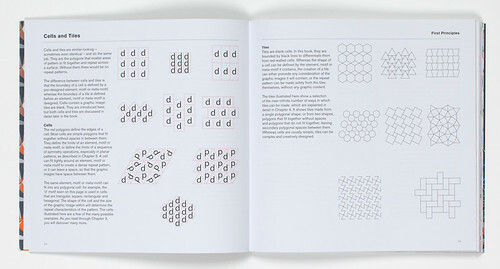 Spread showing examples of ‘Non-tessellating Tiling’ and ‘Superimposition of Grid Lines’. Examples of ‘Translation’ and ‘Glide Reflection’ from the chapter dedicated to ‘Linear Symmetry’. 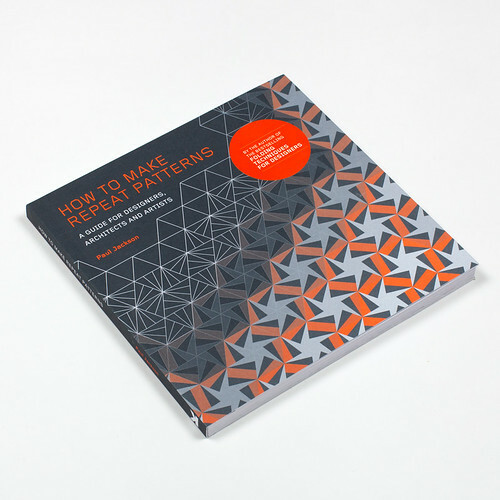 Paul Jackson, How to Make Repeat Patterns: A Guide for Designers, Architects and Artists (Laurence King Publishing, £17.99). Design: Nicolas Pauly and Maria Hamer.